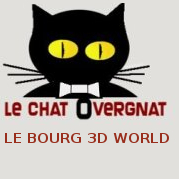 Le Bourg 3D world - Using technology to play a vital restorative role. A 3D World is just a game, isn't it? Well, yes and no. For some, a 3D World is just a place to have fun, and communicate with friends. In this concept it is a graphical instant messenger. However, for many, a 3D Virtual World is a place where one can discover many new ideas, develop valuable creative skills, and learn how best to put these newly acquired skills into use. Someone had to learn how to create it! 3D Worlds are an ideal environment for those with IT experience to share their knowledge with others. Viewed from both sides, they are therefore a perfect environment for those who wish to learn and improve themselves through hands-on experience, under the guidance of others with more experience. The touristic aspects are also interesting. Showing a heritage site or an area of outstanding natural beauty in a virtual world would attract visitors from around the world. Tourists bring jobs for the local communities and increase the revenue flow into the Department. More jobs means that the younger community will not head off to cities to find work but can, after their education, return to help the community that grows with them. Come on Puy de Dome, you're the "experts". You can help! For a first-time visit to Le Bourg, you may log-in with user "Male Guest" or "Female Guest" using the password "visitor" in either case.